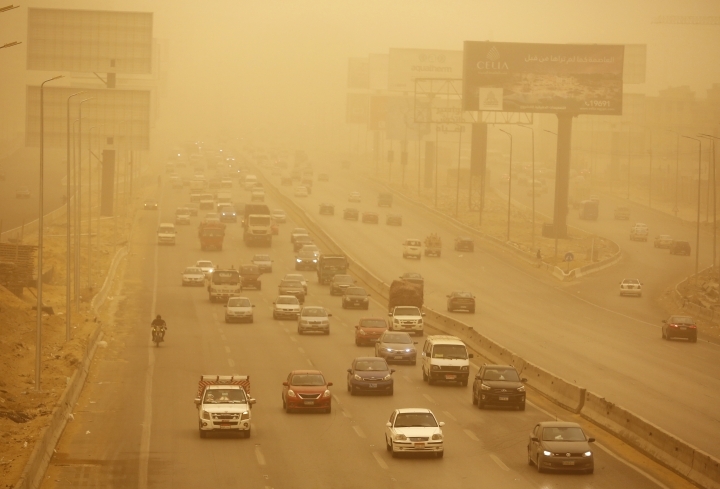 CAIRO — A harsh weather front brought sandstorms, hail and rain to parts of the Middle East on Wednesday, with visibility down in the Egyptian capital as an orange cloud of dust blocked out the sky and pedestrians covered their faces from the wind gusts. The winter's first snow fell on the Syrian capital Damascus by evening, after a day of heavy rain and strong winds. All ports on the Syrian coast were closed due to the prevailing weather conditions. The state-run news agency said high waves in Tartous caused damage to the coastal city's seaside corniche. Damascus University postponed mid-term exams and some schools in the Damascus countryside closed. 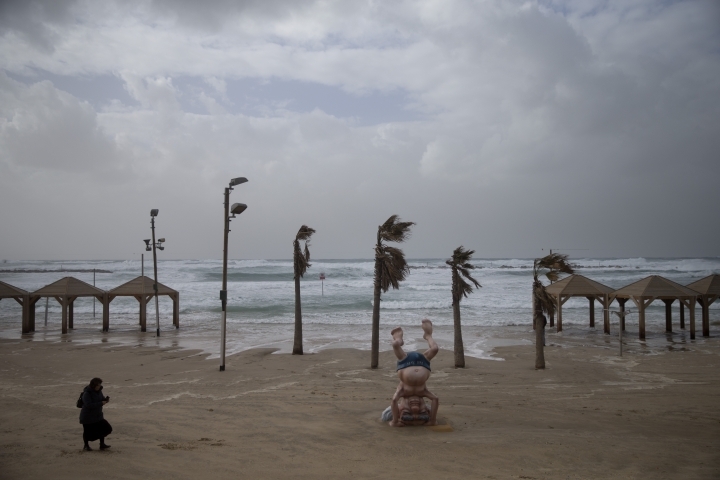 Dusty winds whipped through Israel and the West Bank as well, with hail falling near Tel Aviv and meteorologists announcing that snow was expected later in the day in Jerusalem. Lebanon was also battered by a storm packing rain and snow that cut off major mountain roads, including the highway that links Beirut with Damascus. 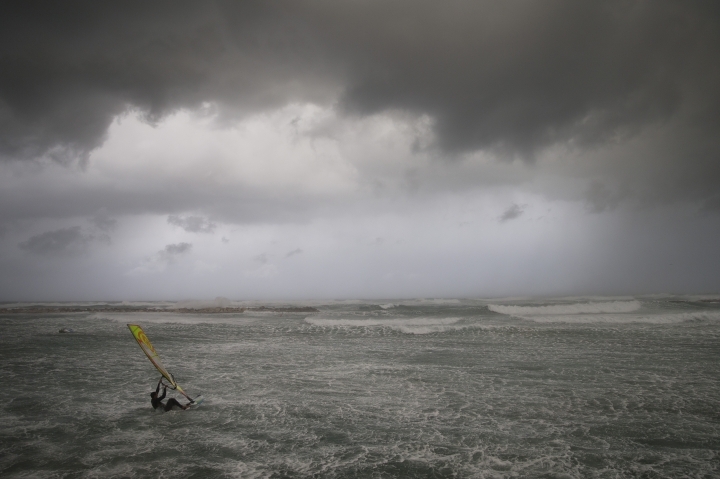 Schools were closed all over the country Wednesday because of the storm, the second heavy storm to hit the Mediterranean country this month. The first storm had a devastating effect on thousands of refugees living in tents in eastern Lebanon's Bekaa valley and areas in the country's north, displacing many whose shelters were either flooded or destroyed by snow. In Cairo, winds reached over 50 kilometers per hour (30 mph), bending palm trees along the Nile River, while in Libya rain, wind and cold weather was driving increased demand for electricity that overloaded the electricity grids and led to power outages. 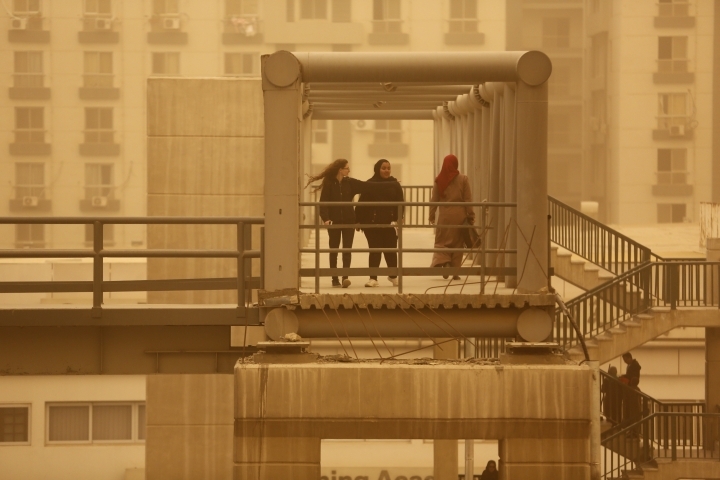 Sandstorms are common in the region in late winter and early spring and Egypt's Meteorological Commission urged caution but did not advise anyone to change their daily routines. Jerusalem braced for its first snow storm in years, with police preparing to shut down major highways and many local schools and universities said they would close early. High desert winds swept through Israel, the West Bank and Gaza, carrying sand and dust, while snow was already falling in Israel's mountainous north, where torrential rain and hail stranded some cars and turned streets into rivers of mud. In Gaza, fishermen returned to port and docked their boats to protect against the stormy sea.